Under the automation and robotics cluster, the BOI (Thailand Board of Investment) promotes projects investing in automation machinery and/or automation equipment with engineering design and assembling of robots or automation equipment and/or parts. In Thailand, which industries are driving the need for expansion of robotics and automation? Automotive and Electrical and Electronics are major industries that drive global automation and robotics growth. There are increasing demands for industrial robots in order to maximize the production’s efficiencies, reduce costs, and solve the issue of labor shortages. From 2010-2014, the automotive industry has influenced the increase in industrial robots investments worldwide with an average sales growth (CAGR) of 27%. In the electrical and electronics industry, global robot sales increased by 34% in 2014 to 48,400 units. 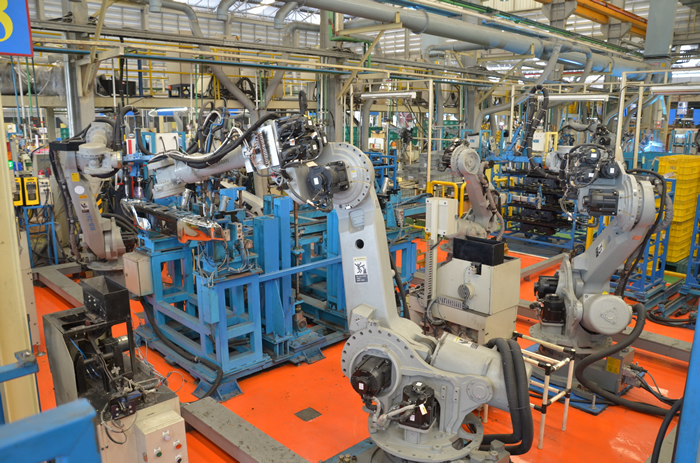 An increasing demand for industrial robots is an immense opportunity for Thailand. In the automotive industry, Thailand ranked 1st for motor vehicle production in ASEAN and ranked 6th globally for commercial vehicle production in 2015. In the electrical and electronics industry, Thailand is the second largest global producer and exporter of data storage units like Hard Disk Drives (HDD). The use of automation and robotics in Thailand’s food and food processing industry has also been increasing. In the agriculture industry, there have been developments to implement robots into farming in order to create smart farming. By doing so, it will reduce the resources and waste generated by agriculture. The world is gradually entering a stage of the aged population. In Thailand, the elderly (aged 60 years or over) accounted for 13.2% of the population. This percentage is to increase to 26.6% of the population in 2030. A combination of the statistics above and Thailand’s world-class medical facilities with more than 1,000 public and 300 private hospitals drive the demand for service robots in order to enhance to quality of life nationally and globally. According to the International Federation of Robotics (IFR), Thailand’s exports for industrial robots will increase from 4,200 units in 2015 to 7,500 units in 2018. What is the role of educational institutes or other related government agencies in Thailand in developing or promoting robotic industry? There are many universities that play a role in education and technology development that support the robotics industry but a good example is the Institute of Fields Robotics (FIBO) at King Mongkut’s University of Technology, Thonburi. FIBO offers Undergraduate and Graduate Programs in Robotics and Automation Engineering. Currently, FIBO is the only specialized education program in Thailand. With Thailand 4.0, there will surely be an increase in interests for this field. Please explain the readiness of human resource to support robotic industry. In 2015, Thailand has produced approximately 82,250 Thai graduates from engineering and related courses. Thailand has evidently shown its capability in the Robotics industry since youth through various competitions won. In other countries there is concern that robotics may cause job losses. Is this the case in Thailand (please explain)? Thailand is looking to industrial robots and service robots to maximize the production’s efficiencies, reduce costs, and solve the issue of labor shortages. More importantly, Thailand is focusing on advanced technology, R&D, innovative, and creative investments which influence robots development. The country is becoming an aging society, this is another factor that will boost the development of service robots. According to a study conducted by The International Federation of Robotics (IFR), it is expected that Thailand will double its 2015 employment figures in the industrial robotics industry, from approximately 7,500 employees to over 15,000 by 2018. Could you briefly explain about super cluster policy and how important of the Super Cluster policy in encouraging investment in automation? Cluster Policy is to strengthen the industrial value chain and boost competencies to attract value-added investment from both existing and new projects in order to decentralize developments to regional and areas that have potential, and create more opportunities for SMEs to start their own businesses. Projects investing under the cluster policy must have cooperation with academic institution, research institution, or Center of Excellence in the cluster to develop human resource and the level technology. The Cluster Policy is the major force in increasing the country’s competitiveness and driving Thailand out of the middle income trap. Under the automation and robotics cluster, the BOI promotes projects investing in automation machinery and/or automation equipment with engineering design and assembling of robots or automation equipment and/or parts. The import duties on machinery in Thailand is at 3% which is considered to be quite low. What is the role of BOI to promote robotic industry? Is there any incentive for investors in this area? 3-year CIT exemption on the revenue of an existing project, accounting for 50% of the investment under this measure (excluding cost of land and working capital). Are there specific areas of expertise that are providing more opportunities than others? Thailand’s robotics industry is on an upward trend, and with factors such as high demand, abundant of suppliers and resources, and well equipped personnel, all areas provide opportunities. However, most of the Thai businessmen in the automation and robotics industry are in the business of system integration and mechanical brain & software development. There would be more opportunities for foreign investment in parts & components manufacturing, given the high value and rising demand reflected in the constantly rising imports of machinery and parts.